Manchester United have parted ways with Louis Van Gaal, and have hired Jose Mourinho as his successor. Manchester United have finally ended the Louis Van Gaal saga, sacking the manager days after he managed United to FA Cup glory. Van Gaal’s future was in doubt after he failed to guide Manchester United to finish in a UEFA Champions League qualifying position – finishing 5th in the 2015-16 Premier League season. 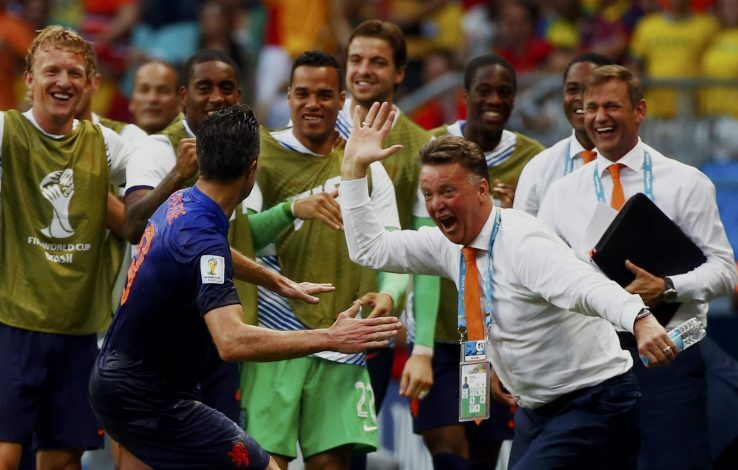 Louis Van Gaal was hired to manage Manchester United shortly after his impressive performances in the 2014 World Cup, where he managed the Dutch National squad to a 3rd place finish. He was highly praised for his tactics when he switched his keepers during the quarter final’s penalty shootout against Costa Rica – which proved to be a massive success. The 2014-15 season saw Van Gaal take over the managerial seat at Manchester United, after the sacking of David Moyes – who endured a disastrous spell in the United hot seat, which resulted in a disappointing 7th finish in the League table. Fresh off the World Cup, Louis Van Gaal agreed to a 3-year deal with Manchester United and named Manchester United legend Ryan Giggs his assistant manager. Louis expressed the mammoth task ahead as he described his inherited team as “broken” and also mentioned that he will be giving the youth squad a chance to showcase their talents. He started off his transfer spree with Spanish midfielder Ander Herrera, paying a hefty £29 million price tag. Soon after, he identified Luke Shaw as his next transfer target – eventually signing the teenager for £30 million (making him the most expensive teenager ever). Later, the Dutchman signed Marcos Rojo from Sporting Lisbon for a £15 million transfer fee, with Luis Nani travelling in the opposite direction in a part of a loan deal. The rest of the transfer window saw Real Madrid star Angel Di Maria, Dutch midfielder Daley Blind and Colombian striker Radamel Falcao join the United squad – bringing Van Gaal’s spending to a whopping £160 million. His debut season in the Premier League did not go as smoothly as he planned, after losing his first official game in charge of United – against Swansea City. Louis’ team also lost to League One side MK Dons shortly after – knocking them out of the League One Cup. Louis Van Gaal’s summer spending spree seemed almost pointless after Herrera, Rojo and Falcao all sustained injuries – rendering them useless. His squad still managed to finish 4th in the Barclays Premier League table (3 places and 6 points higher than the previous season). The 2015-16 season saw Louis’ second season at Old Trafford, after a far from impressive first season. Van Gaal was determined to try and improve his squad; spending more money on big name players. Louis and Ed Woodward managed to bring in Memphis Depay, Matteo Darmian, Sergio Romero, Morgan Schneiderlin, Bastian Schweinsteiger and Anthony Martial, therefore bringing his total spend at Manchester United to a colossal £250 million. He was highly criticized for his huge net spend and lack of improvement. His second season saw him comfortably qualify for UEFA Champions league football after beating Club Brugge in the qualifying rounds of the competition. The rebuffed squad seemed to be finally on track to becoming Champions once again – topping the table during the start of October. Although, the injury list was filled with star players – Luke Shaw was sidelined after a horror tackle from PSV defender Hector Moreno, resulting in a double leg fracture for the teenage full back. The good start to the season faded away, resulting in a slump to the 4th spot in the Premier League table going into November. The team was knocked out of the League One Cup, and was also eliminated from the UEFA Champions League with a 3-2 loss away to Wolfsburg. This meant that United were only in contention for the Europa League title, FA Cup and had dying hopes in the Barclays Premier League. Manchester United had a scare in the Europa League round of 32 after they lost their first leg against Danish side Midtjylland. They later made up for the 2-1 loss at Old Trafford, where they thrashed their opposition 5-1 – bringing the rise of teenage star Marcus Rashford, who scored 2 goals to help United overcome their Danish opponents. But United were unfortunately knocked out by their bitter rivals Liverpool in Europa’s round of 16. The first leg fixture was one that the United fans will never want to recall, a 2-0 loss to Liverpool at Anfield. The match saw Michael Carrick deployed as a center back, and several other controversial decisions were made by the Dutchman. Louis Van Gaal eventually managed to steer Manchester United to a 5th place spot on the Premier League, with only a goal difference denying them a 4th spot. He also managed to win the FA Cup with his squad, after a dramatic final at Wembley against Crystal Palace. Youth has definitely been a focal point for Van Gaal as he has shown generously with his squad selections. Anthony Martial, Marcus Rashford and Jesse Lingard are three young players who have had a sublime season under Van Gaal. Rashford alone has got a goal in every second match he has played, an impressive performance from the youth squad player. Anthony Martial has been a key player for United in the 2015-16 season, with his goals winning plenty of matches and pulling United through FA Cup stages, and also helping United climb up the table. Jesse Lingard managed to win United the FA Cup after scoring a stunning volley form the edge of the penalty area. Louis Van Gaal seemed quite sure of his future, clearly stating that he would expect to be back after this season because he had initially signed a 3 year contract with United, and was looking forward to seeing it out. But despite Louis’ best efforts, Manchester United terminated his contract (which only had a year left) because his side displayed poor quality football. Jose Mourinho has since been confirmed as the new Manchester United manager. It is definitely sad to watch a manger lose his job, with only a year left to prove his philosophies, but it seems the Manchester United board take no tolerance and expect the team to be at the level it used to play at with Sir Alex Ferguson at the helm. “It has been an honor to manage such a magnificent club as Manchester United FC, and in doing so, I have fulfilled a long-held ambition. “Thank you to the owners and board of Manchester United for giving me the opportunity to manage this great club. “I would also like to express my gratitude to the amazing United supporters. They are truly the best fans in the world. “I am indebted to my support and coaching staff, who have given me their all during their time at the club. “I am deeply grateful to each and every member of the club’s staff – the sports science team, the medical team, the kit and laundry department, club administration, the press office, the manager’s team, the Academy team, ground staff and the catering team, both at Old Trafford and the Aon Training Complex, all of whom have given me their unwavering support in my time at United. Never in my 25 years as a manager have I been so well supported in my role. Good bye and good luck, Louis!